GREENVILLE, N.C. – With more than 20,000 distribution, logistics and supply chain decision-makers set to attend MODEX 2016 in Atlanta, Yale Materials Handling Corporation presents an innovative lineup to help attendees gain a competitive edge through improved performance and efficiency. At booth #3147 in the Georgia World Congress Center, from April 4-7, Yale will feature scalable automation, comprehensive power solutions and enterprise asset management designed to solve the toughest challenges facing today’s distribution and warehousing operations. Hydrogen Fuel Cell Technology – Zero-emissions fuel cell technology and on-site hydrogen generation from Nuvera Fuel Cells LLC, combined with Yale’s material handling industry expertise enables a turnkey solution to help reduce emissions and improve performance. Fuel cell-powered lift trucks can be used to help increase efficiency, lower lifecycle cost, reduce operational disruptions and minimize environmental impact. Lithium-Ion Battery – Yale offers the first commercially available, UL-recognized lithium-ion battery pack in the lift truck industry. 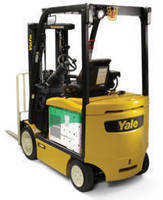 When installed on a Yale® walkie pallet truck, the lithium-ion option lasts up to five times longer than lead acid batteries and requires 23 percent less charging time for increased uptime and reduced replacement costs. RFID Tags – Fitted to a very narrow aisle truck, Yale® A-WARE™, a location-based performance control solution uses Radio Frequency Identification (RFID) tags fitted in each aisle, rather than magnets or reflectors, to automatically enforce speed and lift limitations. This allows operators to focus on meeting operational goals, and can reduce downtime and extend equipment life through reduced mechanical wear and impacts. Wireless Asset Management – Yale Vision helps operations manage costs, protect assets and optimize productivity by monitoring equipment, truck and driver performance to illuminate total cost of operation. Yale Vision will have its own booth, #2263, where attendees can virtually drive trucks in an interactive environment, with a live remote broadcast back in the main Yale booth. In addition to visiting Yale booth #3147 and Yale Vision booth #2263, attend the Yale seminar, “The Profitable Energy Equation for Materials Handling,” scheduled for Tuesday, April 5 at 11:15 a.m. in theater D. The seminar will discuss the financial and environmental advantages of using lift truck solutions powered by hydrogen fuel cells, lithium-ion batteries and compressed natural gas (CNG). To learn more about the technology offered by Nuvera Full Cells, join Nuvera executives Jon Taylor, CEO and Warren Brower, Vice President of Marketing, for a press conference on Tuesday, April 5 at noon in the press conference room. Click here for a high resolution image of a Yale® truck equipped with Nuvera® PowerEdge® Fuel Cells. Yale Materials Handling Corporation is a division of Hyster-Yale Group, a wholly owned subsidiary of Hyster-Yale Materials Handling, Inc. (NYSE:HY). Hyster-Yale Materials Handling, Inc. and its subsidiaries, headquartered in Cleveland, Ohio, employ more than 5,300 people world-wide. Yale is a Registered Trademark and truck is a Registered Copyright and PEOPLE. PRODUCTS. PRODUCTIVITY. is a Trademark in the United States and certain other jurisdictions.